Home >> February 2013 Edition >> March Of The COTS: The Time For Tablets? March Of The COTS: The Time For Tablets? By Giles Peeters, Senior Contributing Editor and Defence Sector Director at Track24 Defence. In this latest column, Mr. Peeters considers the latest developments in commercial technology that impact MISLATCOM. Warfare has evolved and the equipment required to fight in todays conflicts has changed. Yet an evolution in military procurement is still required for many of the worlds major powers. This has already occurred in some parts of the world. Militaries in South America and Africa, for example, are happy to turn to the commercial sector for the latest fit for purpose technologies and to obtain the most cost effective solutions. Commercial solutions providers are flexible and can quickly adapt their offerings to respond to urgent operational requirements. They are also more likely to offer better value, as procurement is subject to stronger competition in the commercial sector. 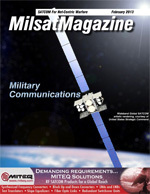 This is an issue thats worth taking a closer look at, as recent commercial developments do impact heavily on the MILSATCOM community. The first of these technologies to consider is the recent launch of Microsofts latest operating system, Windows 8. Up until this point in time, tablet computers used for blue force tracking and other satellite communication exercises were specialized kit pieces that cost thousands of dollars per devicetheir prohibitive price tag made them a rare commodity. However, as stated, warfare has evolved, and battlefield intelligence transmitted via beyond-line-of-sight (BLOS) satellite technology is an essential component of successful intra community warfare. Forces deployed hundreds of miles from forward operating bases need to be able to communicate quickly and easily with their HQs. Military applications have traditionally been designed for Windows operating systemsthe previous Microsoft OS, Windows 7, was retrofitted to operate on touch screen devices. The user interface was clunky and slow as the OS had been designed for a desktop computerthis meant that any tablet Windows 7 was installed on needed to be state-of-the-art as well as processor heavy in order to adequately support the OS. Unfortunately, high specification equates to high cost, which is why tablets were a rare commodity within the military environs. Windows 8 changes the game. This OS is designed for touch control and can be deployed on a range of tablets made by different manufacturers. Windows 8 is user friendly and perfect for exercises, such as blue force tracking. Take a mapping application like FalconView, for example. On Windows 7, its extremely hard to navigate. On Windows 8, it is expected to work quite smoothly. As the OS has been designed for a touch screen, the technology required to run it is not as expensive as what was required for Windows 7. Android tablets are a great example of how this market is evolving. The challenge for military organizations will be how quickly they can adapt to high quality commercial products and services. As a result, military commanders could procure six tablets for the same price they would have previously paid for one military spec device. In addition, commanders dont have to place the order six months in advance, as COTS solutions are easy to procure and adapt to need. Smaller militaries are getting ahead of the game and are faster to adapt as they dont have the traditional relationships with incumbent suppliers to navigate through, which explains the heightened demand from South America and Africa, for example, for this type of technology. Any tablet device designed to receive battlefield intelligence via satellite needs a communications bearer. Another commercial technology thats predicted to impact heavily on the MILSATCOM community is IsatData Pro from Inmarsat. It uses a variety of satellite cellular terminals (each designed for different uses, fixed asset, troop on the move, etc.) to send and receive small packets of data (no larger than 10,000kb per message) to multiple assets, wherever they are in the world. Its a cost effective low-data alternative to traditional MILSATCOM as its designed to send the same message simultaneously to multiple units, rather than a single message repeated. This creates airtime savings and ensures all assets are receiving identical data simultaneously. IsatData Pro is used in commercial sectors, as well, such as transportation and fleet management and oil and gasit is now being considered by forces looking for a cost effective, scalable, command and control SATCOM bearer. BLOS satellite communications are essential for first responders and forces operating in austere conditions which dont lend themselves to radio communications. By using one of the IsatData Pro devices in conjunction with a new tablet, and the appropriate situational command and control software, troops can be cost effectively equipped with situational command and control blue force tracking capability. There is increasing commercial crossover in the military world as procurement teams look for cost effective, flexible solutions. Taking a commercial satellite solution such as the IsatData Pro and combining it with a commercial tablet computer running a commercial OS is a highly effective way of increasing capability quickly and easily. The solutions are interoperable, and there is no excessive lead time or long term procurement buy-in. Carriers such as Inmarsat and Iridium provide the satellite backbone for COTS solutions that range from blue force tracking applications to electronic counter measure signal jamming solutions. Certainly such technology implementations for forces need to be regulated and properly managed. However, by using combined commercial technologies, it is now possible to quickly build military capability that would otherwise have taken years to procure. Giles Peeters currently is Track24 Defence Sector Director. He began his military communications career at RAF Digby (U.K.) in 1997 before moving on in 1998 to the Engineering Office at 751 Signals Unit on the Falkland Islands. In 1999, Peeters joined the Defence Communications Security Agency (DCSA) Corsham, as the Duty Operations Officer of the Global Operations Security Command Centre (GOSCC), before becoming the Military Liaison Officer for Signal Intelligence at GCHQ Cheltenham in 2001. Peeters then worked with the DCSA Corsham Satellite Integrated Project Team (SAT IPT) as their MOD Commercial Satellite Service Delivery Officer. From 2004 to 2007 Peeters significant expertise in commercial satellite communications proved invaluable in Iraq and Afghanistan as he provided front line tactical communication and deployment capability for the Joint Helicopter Command (JHC) J6 SO2 from HQ Land Command, Wilton. Peeters final rank was RAF Squadron Leader. In 2007 Peeters moved to the private sector to consult for organisations such as NATO, on blue force tracking requirements. Now Defence Sector Director at Track24 Defence, Peeters is the driving force behind the launch of the companys new, commercial-off-the-shelf (COTS) blue force tracking solution, situational Command & Control (SCC).